When your dog throws up on the carpet, it’s important to act quickly to lessen the likelihood of stains. The acid in dog vomit can also be damaging to carpets, but it can be removed fairly easily if you act fast. If in doubt, call in the professionals at BCS at 801 561 1730 – we’ll have your carpet restored in a jiffy. Use paper towels to blot up as much of the vomit as possible. Take care not to squash vomit particles down into the carpet. Gross, yes I know, but infinitely grosser if they get squished in. Clean with COLD water. 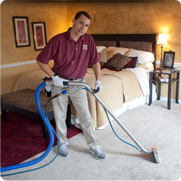 Fill a spray bottle with cold water and spray down the affected area of carpet. Using a towel, start blotting until the chunks and moisture are mostly gone. Be sure to use a clean section of towel with each dab, to avoid accidentally pushing stuff into the carpet. Mix 2 cups of WARM water and 1 tbsp of table salt together. Add ½ cup of white vinegar, 1tbsp detergent, and 2tbsp rubbing alcohol. Add these ingredients to the water and salt solution. Mix all ingredients together in a bowl or cup. Wet a clean kitchen sponge with the solution and use to wipe the rest of the vomit away. This solution will sanitize as well as lift any remaining nastiness. Sprinkle the carpeted area with baking soda. This will get rid of any icky smells and will help the carpet dry faster. Once the carpet is dry, vacuum up the baking soda. And voila! Your carpet should be good as new! If it’s not, or if you’d like a professional once-over anyway, call the experts at BCS today at 801 561 1730.